joint supplement that helps inhibit degeneration of cartilage. • Given that Flexi-Smart is one of the most popular products in the SuperSmart catalogue, it was important to improve the formulation still further and ensure it reflected the latest scientific advances. It still contains standardised extracts of avocado and soybean unsaponifiables, the benefits of which are widely-recognised for joint problems as a whole, whether as a result of osteoarthritis or inflammation. But it now also contains hyaluronic acid, a gel that lubricates the joints and helps relieve the pain of arthritis. • These substances extracted from avocado and soybean – the unsaponifiable fraction of their oils – are particularly beneficial for those suffering from arthritis of the knee or hip. They are powerful anti-inflammatories (due to the presence of beta-sitosterol, stigmasterol and campesterol) and also have antioxidant and analgesic properties. Their high phytosterol content (more than 30% of their composition) means they are able to combat the inflammatory effects of 1-beta interleukins which are responsible for pain. • In clinical studies, they have been shown to produce an improvement in joint function and a reduction in pain, as well as in the need for anti-inflammatory drugs, with no unwelcome side-effects. In animal studies, they were able to regenerate cartilage cells, preventing the adverse development of arthritic phenomena. • Traditionally used during religious ceremonies to induce a state conducive to meditation, prayer and spiritual experience (renowned Indian frankincense), boswellia resin features in the official pharmacopoeia of India and China. It has been used for thousands of years in Ayurvedic and Asian medicine for its anti-inflammatory properties which are effective at treating rheumatic pain, chronic inflammatory diseases, and inflammation of the digestive and respiratory tracts, as well as various skin ailments. • It is currently one of the most popular natural health products, particularly with people suffering from joint pain. It features in the dietary supplement Super Boswellia in a standardised form which is better absorbed than other extracts currently on the market. Its effects are primarily due to boswellic acids, compounds in the resin which block the activity of pro-inflammatory molecules such as the enzymes 5-lipoxygenase and cyclo-oxygenase. Notwithstanding its powerful efficacy against arthritis, boswellia’s benefits extend beyond this disease. As a result of its modulation of oxidative stress and inflammation, it also regulates blood lipids, and helps fight bronchial asthma, rheumatoid arthritis and various allergic reactions. More recently, it has exhibited analgesic activity, increasing the pain threshold and pain tolerance. • Widely-used in skincare products for its anti-ageing properties which smooth out fine lines and wrinkles, hyaluronic acid is also known as a remedy for inflammatory joint pain (especially in the knees). This gel helps to lubricate the joints, relieve pain, improve mobility and promote regeneration of cartilage cells. It is mainly used in infiltrations by rheumatologists. • This molecule, which is a glycosaminoglycan, is abundantly present in connective, epithelial and nerve tissue and thus in the joints and cartilage. The body makes about 5 grams of it each day, but levels decline as we get older which contributes to ageing of the joints. However, scientists have observed that among the Japanese inhabitants of the village of Yuzurihara, known as the ‘Village of Long Life’, levels stay relatively constant. It thus constitutes a beneficial supplement for maintaining bone mass and joint mobility. • To continue exploiting its benefits, and because it can be produced naturally and spontaneously using biotechnological yeast fermentation, it was decided that a physiological dose should be incorporated into the new Flexi-Smart formulation. Its addition really helps improve the product’s efficacy in terms of relief from joint pain, and regeneration and strengthening of the joints. 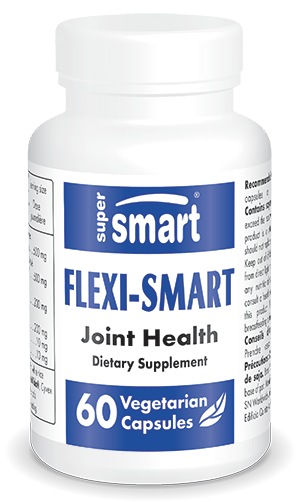 • An essential product for all those suffering from joint problems, Flexi-Smart can be combined with a type II collagen product such as UC-II®, the main protein in cartilage structure, or it can be alternated with another innovative formulation called Joint Support Formula. The recommended dose depends on pain levels but two capsules a day is generally advisable. AprèsFlex™ is a registered trademark of : Laila Nutraceuticals exclusively licensed to PL Thomas. Laila Nutra LLC. International patents pending.